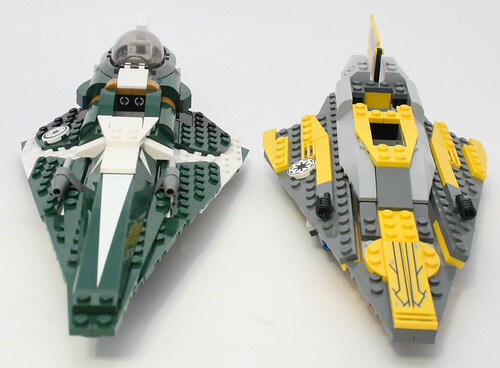 The Jedi Starfighter (Delta-7, for the especially nerdy among us) has become some sort of LEGO annual tradition, the Star Wars version of the City Police 4x4 (which shows up in Advent Calendars, polybags, and sets year after year, for those that do not collect City Sets). 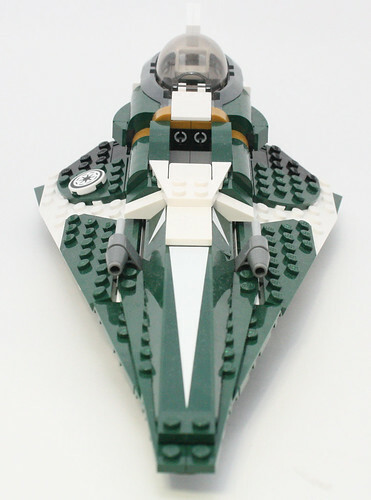 This year, we get Saesee Tiin's starfighter, continuing a storied tradition of making up unpronounceable names and rainbow ships. We've been nice to Mace Windu's fighter, released last year and Ahsoka's Starfighter a few years back. 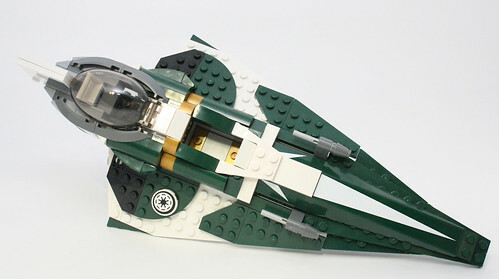 We actually didn't review Plo Kloon's fighter from a couple of years back, which is probably for the best, given that it's far and away one of the worst ships ever made, or Anakin's Starfighter that kicked off the Clone Wars (though technically, Obi-Wans from the Episode II wave in the long-long ago was the first). 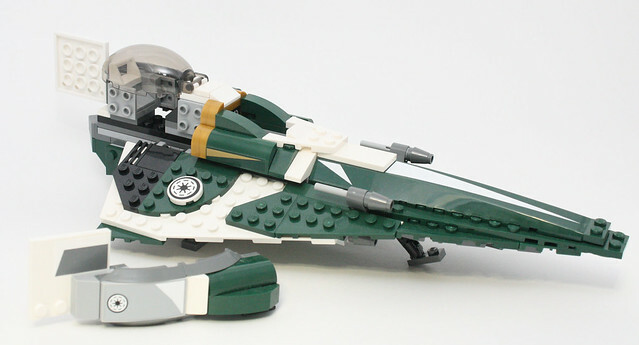 I suppose what I'm trying to say is that this version of the Jedi Starfighter, mostly inspired from the Clone Wars cartoons, has been absolutely done to death. What can possibly be done to make this ship unique and different at this point? It's kind of a given that consumers are desensitized to paying for the same thing over and over wrapped up in some new package each year (see Madden Football, iPhones, Call of Duty games, all of popular television, and the McRibb sandwich), so obviously, LEGO realizes that they can get in on that game. How does our new $30 starfighter stack up? I suppose in the nature of full disclosure, I should say that I play Modern Warfare 3 all the time (and have Black Ops 2 on ore-order), own an iPhone 5 (which replaced my 4), I'm writing this on a MacBook Pro and while I skipped Madden this year, I did buy NCAA football... so perhaps I'm not the best judge of consumers being suckers. I also have never watched a bit of the Clone Wars cartoon, or trailers or spoilers, so most of what I know about it I just make up by glancing at box art. 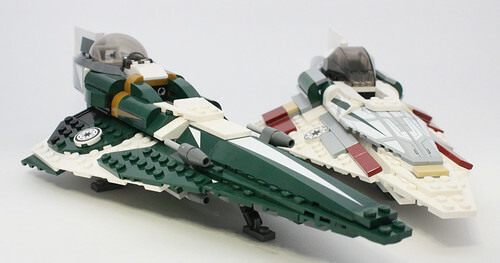 Yet, I love the Jedi Starfighters, both the Eta-2 and the Delta-7 line for some reason. I own all of them except the Ultimate Space Battle, and bought multiples of them to store and keep parts around. I can't explain why a set I'm so critical of intrigues me so, but I can at least try to review the set. 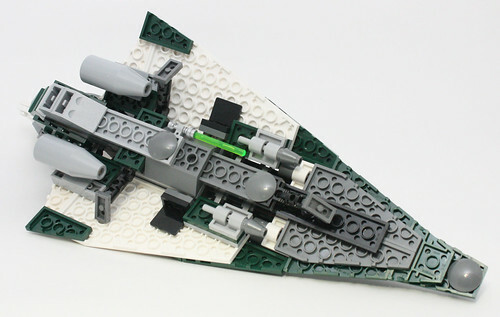 And I'm going to set the tone of the review for this guy pretty early: this is the best version of the Delta-7 Starfighter LEGO has ever made. I set the precedent of reviewing minifigures before getting to the heart of the set, and who am I to break that tradition? 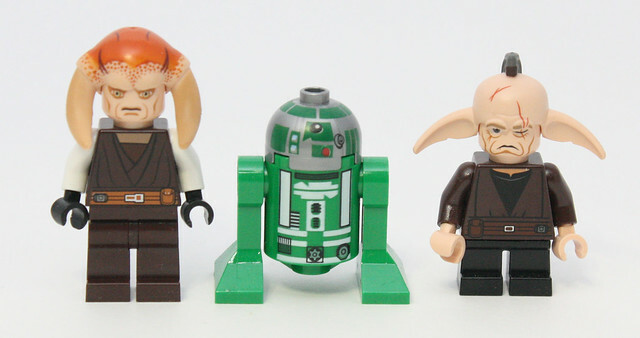 We get three in this set, and LEGO continues their insidious practice of getting us to buy rehash sets by throwing in a new version of a droid. 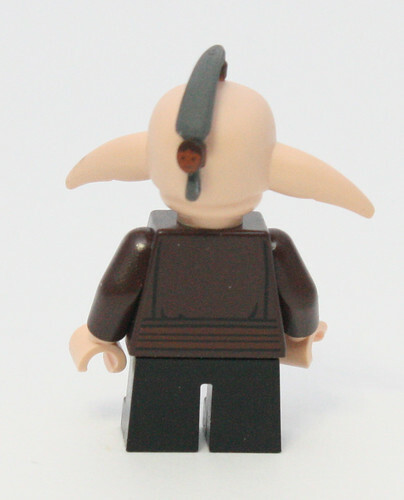 LEGO is most certainly run by Sith Lords. I mean, would anyone have picked up Plo Kloon's starfighter if it didn't have that wonderful little brown astromech droid? Of course not! Mace Windu's fighter included some extra droids that mostly justified the higher price, and it also had a BAMF Jedi in it, so worth it, but these new astromechs are usually a sure sign that a set is a bit of a stinker and they want us to buy it. First up is the set's namesake, Saesee Tiin, a Jedi Master that I know next to nothing about and don't really want to hit Wookiepedia to learn about. Sorry guys, but I enjoy my blissful ignorance of the Clone Wars. I do know that he was firmly in the "unable to do the most basic fighting faction" with Kit Fistoo and Agan Kolar, since he died red-shirt fast when they went to arrest Palpatine. 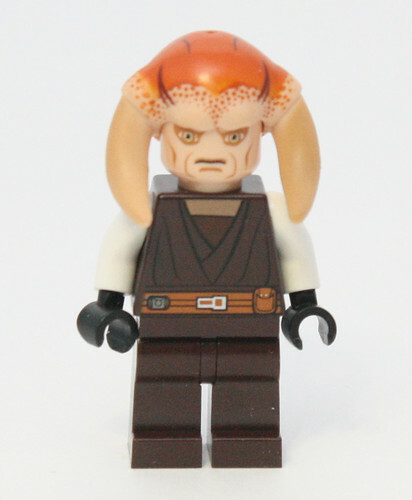 We already had this Clone Wars version in the Jedi Shuttle, and this figure hasn't changed (the Arrest figure features darker clothes and a regular face). I can't really compare this to the arrest figure, because even I can't justify the price of that set (or the TRU markup). Maybe when I make my LEGO run later in the month... have to see how things go. Next up is Even Piell... and I'm not even going to make a joke about that name. 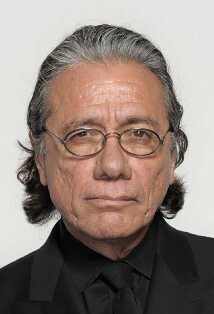 But I will remark that for some reason, when I look at this figure, I can only see Edward James Olmos. Take off those ears and put some salt and pepper hair up there and tell me you don't see it too. 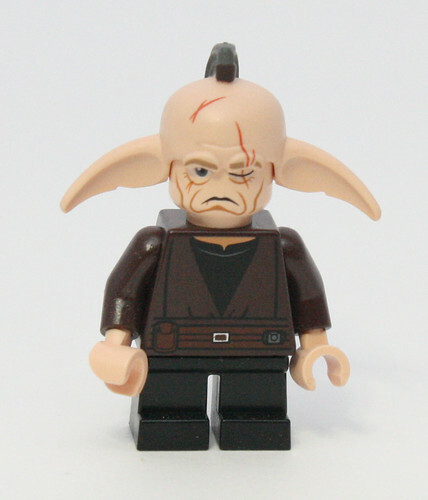 That or this could be Yoda's evil twin... is that stuff around the mouth a goatee or just detail lines? Definitely evil twin if that's a goatee. 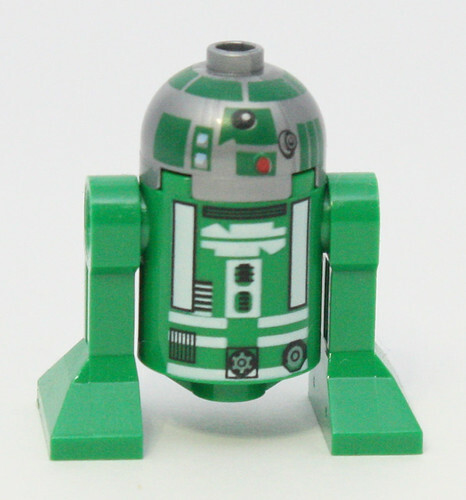 For the hook, the astromech droid, we get R3-D5, one of the two-hundred or so R3 droids that exist in the Star Wars universe (at least given the numbering scheme... not a lot of Serial Number options with just one letter and one number to choose from). There's nothing special about him, truth be told, but much like putting a hat on Malibu Stacy, any collector has to have him. It's the new printing style, and the green works well. 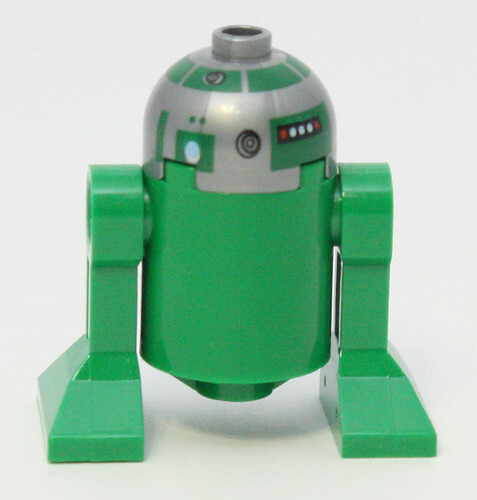 Of course, it's very green, instead of dark green, so he comes off very plastic and cartoony, but we already have a dark green astromech. Sorry for showing off the side of my box there, but there wasn't really a better way to try and position these things. Obviously, Obi-Wan's is the one that stands out, both for its age and being a different style. The rest are all Clone Wars style, and more than any other set, try to capture some unique elements to the series. And that's one of the biggest problems of the Delta-style JSF... it's just not that exciting of a design. Sure, it looks sleek, but it looks like every other sci-fi ship of the last couple of decades. The OT ships were cool because they didn't look like planes (for the most part), and its what made them so iconic. That's a failing of the source material though, and not the model itself. Like every other JSF, it's the wing design, cockpit at the big, small steering wing and that long, tacked-on nose. Where this model sets itself apart is HOW it achieves that. First, this ship, unlike all of the others, does not use a bar with the big flag. Originally, these were colored and/or stickered, but that died off quickly. Here, we do get some stickers, but with a couple of plates added around the cockpit edge. From a building point of view, this is just fantastic, and so different that it gets you excited for the rest of the build. The set does use stickers, like the other JSF's did (save Ahsoka's and the original), but it uses them so much better. Look at that top picture above and how stickers only accent the front nose cone, but brick choice for the top of the wing creates the rest of the color and swoosh of the white. That is just beautiful. Or how the little bit of gold blocks make the sticker just accent the shape of the ship instead of screaming STICKER at us. Even on the slope, it blends. While Space Invaders is still my favorite sticker, this is probably the best use of them in a Star Wars set. Speaking of that cockpit section, it uses hub fenders to great effect, something that was teased at in the battle packs as railings for guns. This effectively hides the gap created by not building a place for the glass, and looks wonderful. This is the first time LEGO has really tried to hide those gaps, and I hope to see it show up on a lot more ships. Even the use of flick-fires, positioned on top, set it apart. It wouldn't be hard to do a little bit of modification and put some guns up there instead. On the bottom, we don't gear nearly as much detail. The over-complicated launching mechanism from Mace Windu's fighter are gone, replaced with minimal flick-fires. Yes, flick-fires still stink, but I'm a lot more forgiving of them taking up only 16 parts in the overall set vs. 40. The top-ones are new to this version, and actually connect from a technic piece on the underside. The engines are just on the back, and there's not much to see. This version of the JSF really threw me for a loop when I first built it. I did not have high expectations at all, especially since I built this right after I'd wrapped up the Sith Fury. But after putting it together, I had to go and build all of the other versions, just to try and show off how much they'd improved the overall design. Previously, I'd always looked at Ahsoka's as the definitive version of the JSF. Mace Windu's had too many stickers and Plo Kloon's had too much awful, but the bar has been reset. This set makes me want to go back and mod all of the older versions to match the new aesthetic. Vader's TIE was the last set that had me wanting to do that (and the new TIE Fighter gave me the canopies I needed to do it. In the end, we're given a very worthy update and redesign to what has become our most familiar ship, a $30 price point that's actually pretty easy to swallow, and some minifigures that remind me of Edward James Olmos. That's a win all around. If every $30 set delivered like this one did, I think we'd be willing to swallow the price increases a bit easier. he was firmly in the "unable to do the most basic fighting faction" with Kit Fistoo and Agan Kolar, since he died red-shirt fast when they went to arrest Palpatine. That sentence is golden! Thanks for the review and the comparison with the other JSFs. I think it's great how this new one uses the bubble canopy with c clips as opposed to the old angular snap-hinge ones. But, you left out the awesome escape pod feature! Want to know how much your LEGO investment is worth? Great review - I just bought/built this one this week and was agreeably surprised as well. I also like the escape pod/cockpit feature for some reason...at least it adds more play value to what otherwise amounts to a flying triangle in a new color. RE: the Jedis - they were at least on the Jedi council in the movies, so they aren't totally just Clone Wars constructs, even if as you say they seem to have been off sipping blue milk and smoking bantha doo doo during every lightsaber fighting class. I had a hard time taking Even Piell seriously when I saw him in the Clone Wars because he looks so much like a grouchy Norn. I guess it's the ears. The ship itself looks great; I definitely love the color scheme. It might just be my favorite in that respect. Why don't you watch the Clone Wars? It's pretty good. I am the opposite, except for the JSF I don't collect CW Lego and I like the show. Good review, thanks. 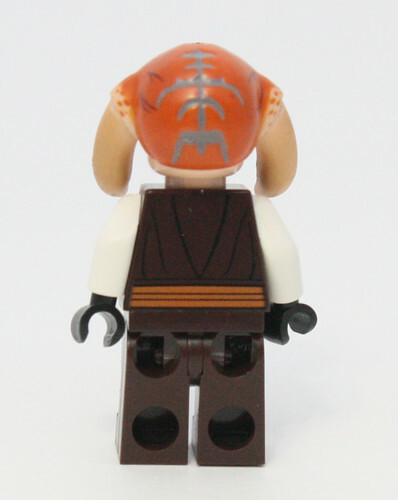 I personally liked the plo-Koon one. The only two I have are that and the anakin one, but I hope to gather more, I really like these. It really was the Plo-Koon ship, though, that got me into "collecting" them. I hope to get this on clearance some day - I'm really just commenting to say I loved your humor in the review and point out the irony that all Star Wars collectors were "consumers being suckers" long before iPhones and Madden. guykir wrote: Why don't you watch the Clone Wars? It's pretty good. I am the opposite, except for the JSF I don't collect CW Lego and I like the show. Good review, thanks. Mostly because I haven't ever gotten around to it, but also because I didn't like the PT, and it's firmly in the PT. I figure if I don't watch it, I won't have to form any real opinions on it. Ultron32 wrote: I personally liked the plo-Koon one. The only two I have are that and the anakin one, but I hope to gather more, I really like these. 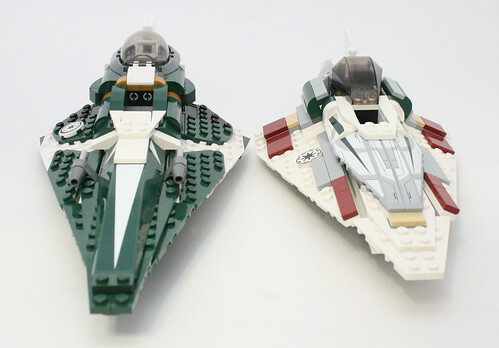 It really was the Plo-Koon ship, though, that got me into "collecting" them. If you ever pick up the Ahsoka or Mace Windu one, you'll see what I mean on the quality. It's way below the rest of them overall. I'll admit, this looks impressive. 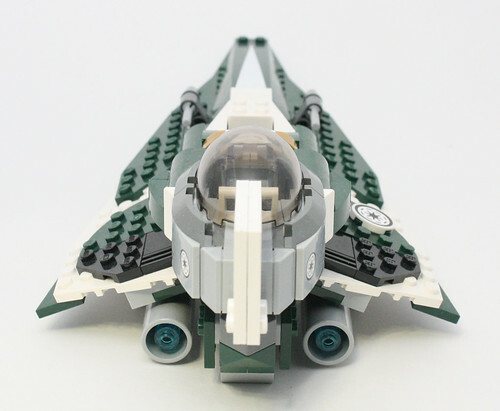 I'll never pick on up, mind you (The only JSF I own is the original with is fantastic enough for me), but I have to give kudos to LEGO for what looks to be a pretty great set. And for a decent price, too. I'm looking forward to getting this set. I don't have any of the previous JSFs, but this one looks really nice with the new design and colors, and the figs are not bad. Edit: Finally got this set, and I like it quite a bit. Great build with some pieces I hadn't seen before (I don't have too many sets).